How to locate a birthplace in time and space? In Slovenia, the primary sources of genealogical information can be obtained from the civil and ecclesiastical archives, where these are largely still available in the form of original books or their duplicates. Older records in books are written in Latin, later in Italian (for the west part of Slovenian territory) or German with Gothic characters (for majority of Slovenian territory). Since 1884 personal records have been kept in Slovenian lnguage. Up to 1770 books were kept in the form of free-format event record, after 1770 in tabular form, which faciltates reading. Only minor part of parish books has been scanned and made available on-line. The main registers, used for genealogical research are: birth, death and marriage books, for which responsible registrars or priests enrolled the life events of the residents of parish to which they belonged in a given period. Thus, it is necessary to know for each period in a history, what was administrative or church territorial and hierarchical organization, to place certain place of birth, marriage or death into proper source book and to locate the register in the correct archive. Andrej PRAZNIK (born 8 Apr 1874 in Male Lašče 6, parish Velike Lašče), arrived in 1899 to New York with the Kaiser Wilhelm der Grosse ship. Fortunatelly information of his last residence in Velike Lasce matched to his birth place (Male Lasce 6, the Peščak farm) later found in parish records. in 1991 Slovenia became independent and in 2004 joint the European Union as one of nowadays 28 Memeber States. Nowadays it is hard to imagine that might be difficult to locate a country within Europe. Going to settlements, as they were named and affiliated centuries ago, is even more difficult. Today Google Maps are available at every question: ‘Where is this?’. 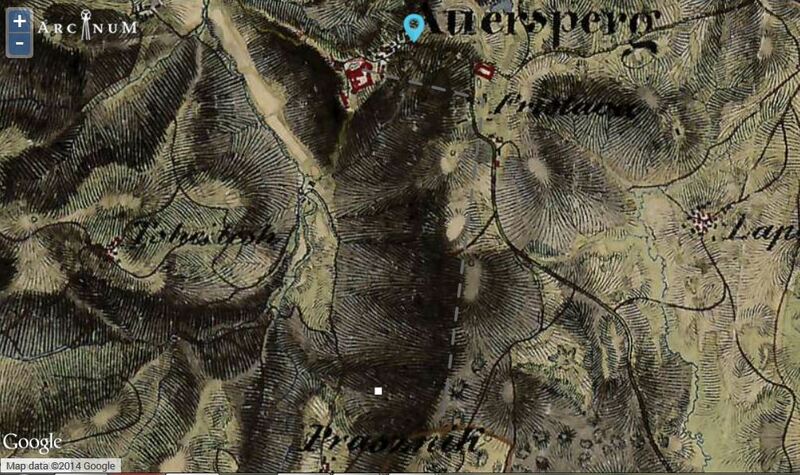 In the past, the best maps were drawn only for military purposes – as the best records were made for collection of taxes and solders… In one of the best old military maps from Austria-Hungarian Monarchy surveyed before 1850, which were recently digitalised, I managed to find a settlement PRAZNIK (probably formed from one family name Praznik and not more), which was below the hill, in distance near 1500 m from big castle Turjak (Auersperg). Between Turjak and Praznik I discovered a settlement PRISTAVA (400 m from the castle). Bingo! This Pristava was no longer listed among settlements in ‘The early 1900s gazetteer…’ in municipality Turjak, where we find Male Lasce and Praznike. Check some data below! We were not so lucky in searching of Andrej’s wife arrival: Agnes KOSLER, later recorded as Agnes Hellen Koslar (born 1882 in Pristova). Key words ‘A. Kosler‘ return a lot of matches, but none for correct person. Also in Slovenia there was not possible to find her birth place in appropriate parish near Velike Lašče. Pristova place does not exist, but name Pristava was centuries ago given to many locations where landlords had settled their servants, who took care for lord’s horses, catle and other animals and grow basic crops. This entry was posted on 27/12/2014, 20:44 and is filed under Roots. You can follow any responses to this entry through RSS 2.0. Responses are currently closed, but you can trackback from your own site.